Telecommunication service providers/operators and service providers in other verticals are facing challenges when producing and deploying new products or upgrading existing products. The time-to-market is very slow because of the complexity and volume involved in the enterprise catalogue. 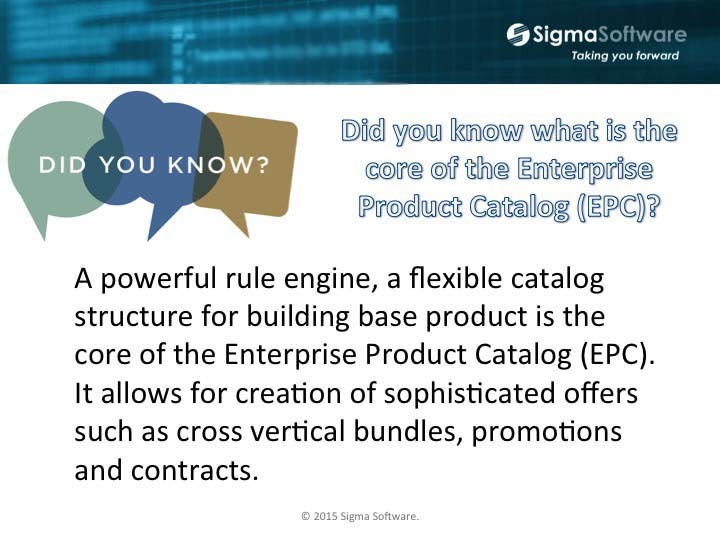 Sigma Software Enterprise Product Catalog (EPC) solution is designed to help Communications Service Providers (CSPs) to deliver innovative, profitable products at a lower cost and in less time. Other industries like utilities, water, retail etc can implement the same solution as their key enterprise catalogue management application integrated with their core billing application. The Catalogue Management feature of the solution allows flexible hierarchical structure to suite any vertical, and has a powerful rules engine to dynamically differentiate product properties such as price, presentation etc., and to enforce overall product selection rules. Sophisticated cross product or cross vertical bundling can be achieved using the hierarchical structure and the rules engine. The Enterprise Product Catalog (EPC) solution helps CSPs create and maintain their product catalogues in a user-friendly and cost effective way. The solution ensures the accuracy and quality of the product catalogues and significantly reduces time to market. Complex Offerings – either as part of a Package/Bundle or as part of the EPC Tree. Creation of Folders (Nodes) and Elements (Features) as required by various EPC owners. The Folders (Nodes) would have an optional link to data defining Bill Presentment and data defining the Marketing View (Customer view) on various UI’s. Mandatory/Optional designations from Folders (Nodes) to Elements (Features). Re-use of the same one Billing Element ID and its immutable attributes in different parts of the EPC, but with optionally different mutable attributes. 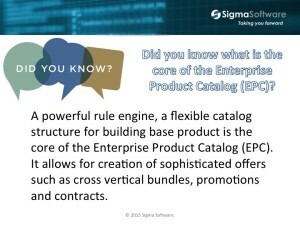 Sigma Software Did You Know series – What is the core of the Enterprise Product Catalog (EPC)?